Close to Beach, Shopping, Golf and Restaurants! Check our calendar for open dates. Newer, upscale townhouse...no worries, no cares. Scenic Gulf and lake views, plus easy walking paths lead you to our pristine sugar-white sandy beaches. Located right off Scenic Highway 30-A. Finally, enjoy the rest and comfort you deserve, with plenty of space to spread out and relax. Newer non-smoking unit has plenty of amenities to make you feel at home. Light, open, fresh color scheme, carpet and ceramic tile throughout. The latest furnishings and tastefully decorated. Now featuring High Speed Internet! Large Master Suite with King bed, private bath, jacuzzi tub, and large private patio deck with Gulf and lake views. One guest suite with a King Bed, and another guest suite with a Queen bed and Bunk Beds. Each bedroom has its own TV/DVD/Cable TV and private bath! Just steps to Oyster Lake, Dune Allen Beach and Santa Rosa Golf Club, and only ten minutes from fabulous shopping and dining at Gulf Place and Seaside (East) or Destin/Sandestin (West). Book now to enjoy those tranquil, beautiful sunsets you've dreamed about while sipping your favorite drink from either of our two spacious patios, out by the docks on Oyster Lake! Just walk to the beach.....it is evident! Owner who truly cares about your needs and will strive to make sure your stay a fantastic experience! More than you could need! Tons of Cooking Utensils, Silverware, Plates, Glasses, etc. Two balcony Porches on 2nd and 3rd floor. Place was terrific- quiet, quaint well manicured community and a very close and easy walk to beach, which was delightfully away from the crowds and pristine! Owner was terrific to work with and we had everything we needed! Plenty of space, nice linens and well stocked kitchen. Would love to come back in the future! This was a perfect size for our family and in walking distance to the beach. 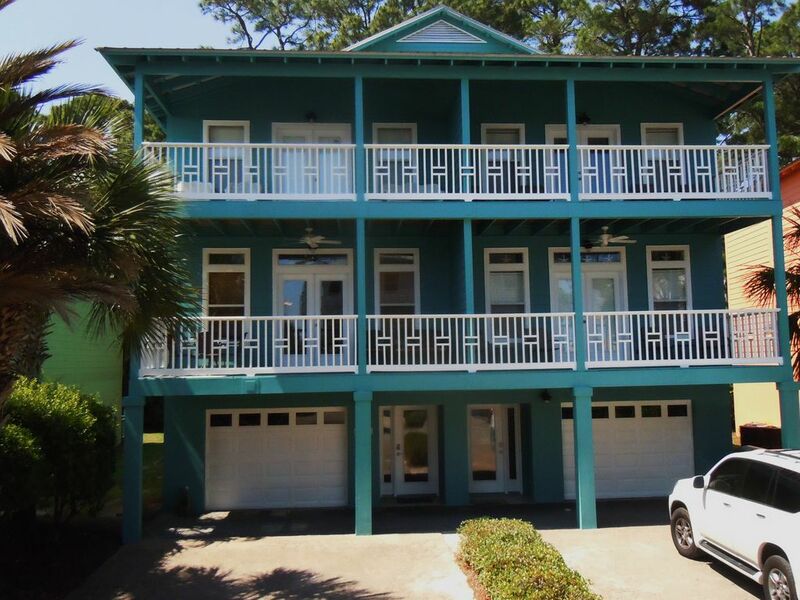 You get the lake view and ocean view from this location and located right off of 30A and a car ride to other quaint beach towns. The pictures on VRBO do not do it justice, the rental was spotless when we arrived and had everything we needed. It was nice that they keep beach toys, chairs and umbrellas for our use. Our one and only complaint (if you can call it that) was that the loveseat was horribly uncomfortable, but it wasn't needed much. The owner was very pleasant to work with and accessible when needed. We had a fabulous week! TH is well organized, nicely furnished and very comfortable. It’s a great place for a big family. This time it was an excellent place for the two of us (and the pet!). We had a very nice time there and will definitely come back again. Great location on 30a, close enough to restaurants and the best beaches in the world. This house is perfect for your family vacation. The house is close enough to everything but on a quiet private lane. The house is well equipped with a great layout. The owner was extremely responsive to all my questions and really made us feel welcomed. The community pool is a great size for the amount of homes and the walk to the beach is super easy. We'll definitely stay here again! Well-kept, Great Stay, Great Owner! We're a Panama City family that booked this property for a multi-week stay due to being displaced by Hurricane Michael. The owner was very accommodating and fantastic to work with. The location is very close to the beach, easy to get to, and was very clean and well-stocked with all of the necessities. I whole-heartedly recommend you make this your vacation destination - 30A is beautiful, welcoming, and without all the crowds. Hiking along Beautiful Oyster Lake and a biking/jogging/walking trail along Highway 30-A and beaches of South Walton! Holidays, Special Events, Weekend Reservations, Regional Events and other Events will incur Special Pricing! Rates are subject to change until reservation is confirmed.